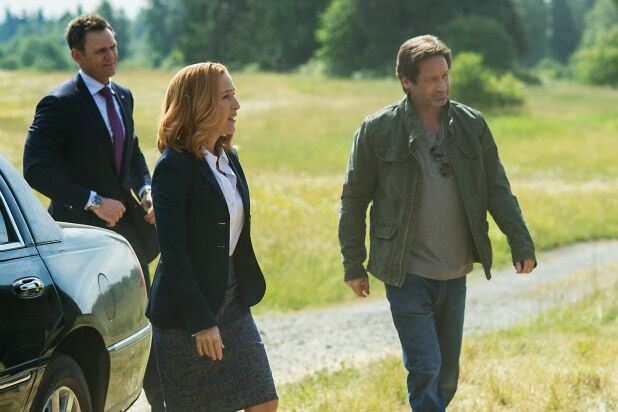 “The X-Files” is back on Planet Earth (and Fox). Just don’t blink, believers: After tonight, the revitalized alien-hunting series has just four more episodes in its new run — but impressive initial figures for the new version might mean more is on the way. Fox, which doesn’t play live-plus-same day TV ratings publicly anymore, is certainly celebrating privately after using the NFC Championship to launch its revitalized series to strong numbers. Per admittedly wonky fast national Nielsen figures, “The X-Files” debuted to a gaudy 5.1 rating in the key 18-49 demographic on Sunday, when it hauled in 13.5 million total viewers. That Nielsen data stream is rather imperfect, however, as the premiere was delayed by live football until about 10:24 p.m. ET. But the time zone shifting won’t necessarily be a bad thing for Fox in the end — it’s likely that both the demo number and total viewer tally will actually grow when final figures are unveiled on Tuesday. Not bad at all, Mulder and Scully, especially considering last night’s late “X-Files” episode had already scored above its original final season average. And actually, in total viewers, last night even beat its second-to-last season average, when essentially everyone who planned on watching the show was tuning in live. During its final season, 2001-2002, “The X-Files” averaged a 4.5 rating and 10 share in the demo and 9.1 million total viewers. The prior year drew a much bigger 7.2 rating and 13.2 million overall audience members. We’ll see in a month or so how close the 2016 run gets when episodes are a little more spread out. That said, the small order’s more favorable average could easily be offset by changing viewing habits — which is why Fox swore off live viewing in the first place. It’s just a shame that there aren’t NFC Championship Games every week. Per the social media platform, Sunday’s “X-Files” premiere inspired 276,000 tweets from 96,000 people in the United States. The tweets were seen by a live audience of 2.9 million people, accumulating 18.9 million impressions. Those numbers are measured from an hour before the start of a telecast until three hours after it ends. The most-tweeted minute of Sunday’s “X-Files” was upfront. At 10:28 p.m. ET, Twitter users used their 140 characters to express great pleasure that the program kept its original opening theme song. We’ll see how pleased those viewers remain with the lukewarmly reviewed reboot as the latest mystery continues to unfold. After all, in 2016, quality can (somewhat) be quantified too — and those may be the only numbers where the new “X-Files” is falling short. Considered Season 10, this mini-run is currently rotten on the Rotten Tomatoes TomatoMeter, netting just a 56 percent rating. That’s pretty much in-line with Metacritic’s 58 rating, neither of which will help inspire sustainable intrigue. Thanks to the Internet, the truth is out there these days — both good and bad. Episode 2 of “The X-Files”airs tonight at 8 p.m. ET on Fox.